rocky's bru: The Pujut shocker: So now anyone - even a foreigner - can be Malaysian ADUN? The Pujut shocker: So now anyone - even a foreigner - can be Malaysian ADUN? Bangsar, 17 June: The blogger Life of Annie's nonchalance towards the latest DOJ's shocker Part 2 (pls read Couldn't care less) didn't shock me, really. I think it describes, more or less, what Malaysians in general feel about the antics involving the US Department of Justice and the enemies on both political sides of the political divide (pro-Najib, pro-Tun). Malaysians hope that the DOJ does not drag its sloppy feet any longer and proceed with the promised legal battle between the US Government and Jho Lo & Reza Aziz. So we can all get on wth our lives. Amiin. 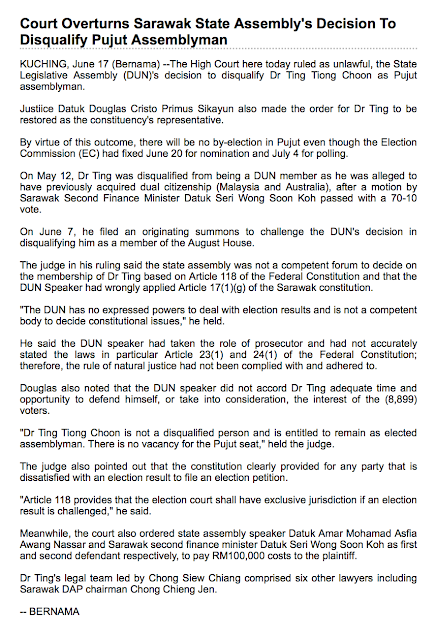 As for now, the real shocker to Malaysians is the court ruling in favour of Pujut assemblyman, who allegedly is, in effect, an Australian. 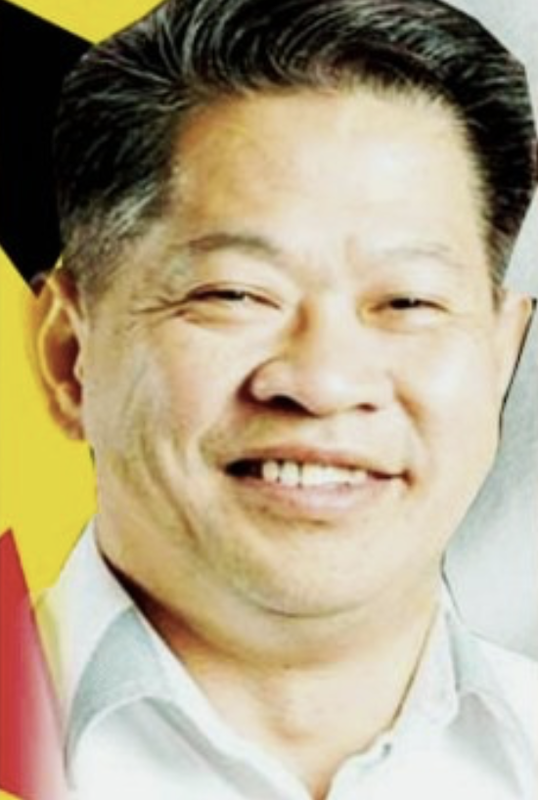 So does the court ruling mean that anyone, even a Malaysian who holds the citizenship of another country, can stand for election in Malaysia and go on to become an Assemblyman or a Member of Parliament? Does it mean a Malaysian can have dual citizenship? As I understand it, the answer to both questions is, still, NO. Deputy Prime Minister and Home Minister Zahid Hamidi made this very clear that "a Malaysian will automatically lose his Malaysian citizenship if he is found to have dual citizenship". So the law on this is quite clear. Where the Sarawak state assembly Speaker might have erred, or so said the judge in the Pujut case, is that in disqualifying the Pujut assemblyman, the Speaker was exercising a power that was not his to begin with! Yes, the authority over matters related to citizenship lies with the Federal Government. Jadi apa susahnya ,sekarang peranan Jabatan Imegresen pula menghalau mereka yg tidak mempunyai kerakayatan Malaysia utk keluar dari Malaysia,biar pun beliau adalah seorang ADUN yg di benarkan oleh Mahakamah.Taraf beliau sama dgn PTI indon atau Bangla.Saya harapa kerajaan bertindak mengikut undang-undang. I think something is wrong with this judgement. Judge is not always right for he is also a human being who is open to anything negative. A foreigner should not allowed to become ADUN here because his faith to the country is questionable. Agree if citizenship of this ADUN is taken off, thus he is still not fit to be ADUN according to the constitution. The authority also should investigate further if similar thing happen to any other ADUNs and MPs. I read there's one in Perak DAP representative. If a Bangla can be bumiputera .... a right originally intended for Orang Asli can be stolen and abuse by UMNO-PAS Malay Bangsat Negara.... and Pujut Speaker and Election commission acting beyond their Jurisdiction to enforce Cowbouy IS Islam Laws..... To hell With Malaysia System of justice and Judiciary. Goes to Show Sultan-Agong_Govenor IS ISlam will continue to condone IS radical Islam UMNO-PAS chaotic Agenda because they thinks their few guns can control the 99% Malaysian sick of their Ongoing Felda Corruption! !